On their best run since September and through to the Champions League quarter-finals, Borussia Dortmund faced a tough test against Hertha BSC on Saturday. The club from the German capital are enjoying a great season, particularly at home, where they have won more points than any other side in the Bundesliga. In the middle of a busy schedule, Dortmund made a number of changes. Marcel Schmelzer came in for Lukasz Piszczek and Matthias Ginter replaced the injured Sokratis Papastathopoulos, pushing Marc Bartra to the right of a back three. Further upfield, Shinji Kagawa and André Schürrle came into the side for Ousmane Dembélé and Christian Pulisic. Those changes meant a slight change of shape for the visitors, who went from the 5-2-2-1 they have favoured recently to something more like a 5-2-1-2. Hertha, meanwhile, had a plan to press the back three without leaving any spaces through the middle of the pitch. Combined with Dortmund’s rotation, their adaptations to their usual 4-2-3-1 helped them come out on top. 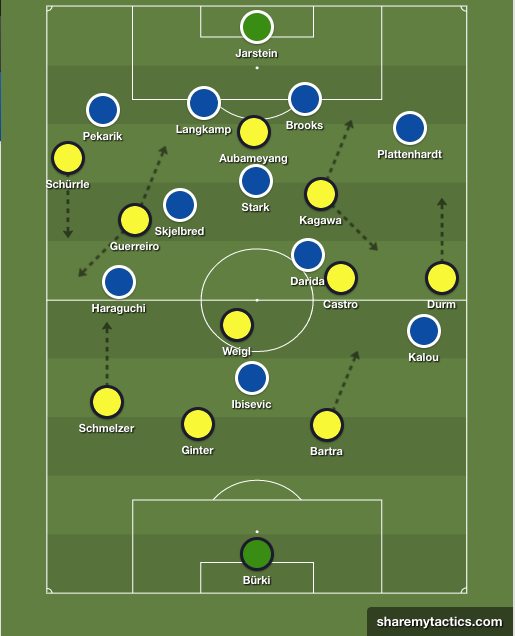 Instead of their usual shape, which has Vladimir Darida lining up behind Vedad Ibisevic, Hertha opted to use Niklas Stark as a lone defensive midfielder in a 4-1-4-1, giving Dortmund plenty of issues in build up. With Salomon Kalou and Genki Haraguchi encouraged to press the halfbacks diagonally and block passes to the wing backs with their cover shadows, they limited Dortmund’s use of possession significantly. Stark, Skjelbred, and Darida were all man-orientated, preventing ball progression as Dortmund lacked the individual technical ability to combine efficiently. The line-up was lacking players adept at linking up or beating their counterpart in a one-on-one. It is no coincidence that almost everything good came from Shinji Kagawa, including a second minute chance for André Schürrle. Kagawa’s brilliance shone through continuously but Schürrle and Aubameyang were too far wide to efficiently link up with him early on. Even when they came infield, they do not have the short, sharp passing or dribbling ability required in such tight areas. The same applies to Erik Durm, who was stationed very high on the right, and Gonzalo Castro in the middle, who often struggles when pressed. Recently Dortmund have used a ‘double 10’ but Kagawa was asked to shoulder all the creative burden with nobody to bounce the ball off of. With Schürrle, Aubameyang, and Durm all staying wide, Dortmund were not able to regularly sustain attacks, helping Hertha break. Fewer connections also made the usually impeccable Julian Weigl a little sloppy in possession. All in all, Dortmund fielding a lone number 10 played into the hands of Hertha and their man-orientations. A changed backline made Dortmund look shaky in defence, particularly the wide areas. Salomon Kalou was a constant threat from the left wing, attacking the spaces between Durm and Bartra, who looked particularly vulnerable on his weak side. The Spaniard has excelled on the left of the defence with Sokratis inside him but, between Ginter and Durm, looked much more unsure of himself. The same was true on the other side, where Vedad Ibisevic orientated himself on Marcel Schmelzer for aerial duels. In both cases, Hertha looked to pull Bartra and Schmelzer out of the defensive line before exploiting the spaces left behind them with running from the central midfielders. It worked well, with Dortmund failing to shift accordingly each time one of the defenders moved out of the line only to lose a duel. This hasn’t been such a big issue with a regular backline but, including Bartra’s switch to the right of the back three, none of the central defenders were playing in a familiar position. Nobody in the back five had a regular partner alongside them. Having taken the lead after stealing the ball from Matthias Ginter, the hosts probed the half spaces on the break with Kalou, Darida, and Skjelbred all losing their men. Hertha’s second half winner came from a similar situation, dragging Schmelzer and then Ginter out of position to run directly at an exposed Marc Bartra. Short backwards passes were a feature of their play, freeing up runners of midfield to attack directly. In this instance, Mitchell Weiser was brought down and the free-kick was scored (brilliantly) by Marvin Plattenhardt. The home side’s corners also posed a threat, with Vedad Ibisevic and sometimes John Brooks attacking the near post as a decoy only for the ball to be sent towards three players rushing in at the back. Concerned by the size of Ibisevic, Dortmund found themselves too preoccupied by his movements. After the break, some adjustments from Tuchel helped Dortmund wrestle control of the game. In possession, the black and yellows almost reverted to a back four, with Raphael Guerreiro moving into centre midfield and the three centre-halves shifting to the left of the pitch. André Schürrle now kept extreme width on the left. Castro moved to the right of Weigl and Guerreiro’s movements immediately caused issues for Hertha, who were suddenly outnumbered in midfield and more stretched across the pitch. Out wide, Pekarik tried to stick close to Schürrle and Kalou had less access to press the defence, meaning he was more focused on covering Durm down the right than putting the first phase of possession under pressure. It didn’t take long for the dominance to show, when an attempted ball through to Guerreiro made its way to Kagawa in the middle via a deflection. Smart movement and a powerful finish from Aubameyang levelled the score. After the goal, Dortmund mounted attack after attack but Dortmund’s lack of presence in the right half-space made them easier to defend. Castro and Kagawa would both veer out to the right but there was never anyone on that half of the pitch on the same line as Schürrle and Aubameyang. That left Durm with an entire wing to cover and very few connections when he was in possession. Marc Bartra looked to move the ball forward on that side of the pitch but his first touch, pushing him away from pressure and into space, usually moved him onto his left foot. On the opposite side this works perfectly, teeing himself up for a vertical pass with his stronger foot, but it led to him playing the ball square or backwards. Durm’s high positioning also left BVB exposed on the break. Stationed high upfield, he had a lot of ground to cover when Hertha won possession. Dortmund’s coverage of the pitch in transition to defence was made worse by Guerreiro’s new role, which left him a long way from his left wingback role when possession was lost. Late substitutes Christian Pulisic, Ousmane Dembélé, and Mikel Merino could not have much of an influence. Pulisic and Dembélé were used on the right wing and half-space but, having built play on the left all game, Dortmund failed to adjust their build up and could not get them involved enough. When they did get on the ball they were effective but somewhat isolated and heavily covered by Hertha’s defence. Heading back home, there were a few things left for Thomas Tuchel to ponder. The signing of Schürrle has been a poor one, as we already knew, and finding a place for him is becoming increasingly difficult. Shinji Kagawa gave his best performance in a long time and deserves more chances soon, while the importance of Sokratis cannot be understated. Having said that, Dortmund created enough situations to come away from a tough fixture with all three points but were only lacking the final ball. As for Hertha, now three points behind Dortmund in the league, the 4-1-4-1 setup suited Darida well in particular and must be considered in future. Their home form has kept them going through a rocky patch and should see this win as a springboard for their ambitions to qualify for Europe.